The CMS is just the start. Build and manage websites and web applications for clients of all sizes without limitations. No technical expertise required whether it's updating content, writing Blog Posts or creating Landing Pages. Simply click and edit. It's easy to use but it's also extremely powerful. 'WebApps' allow you to create database driven content with ease and display it anywhere. Ensuring the Search Engines find your content is at the very core of Siteglide. We'll automatically optimise your content or you can take control. 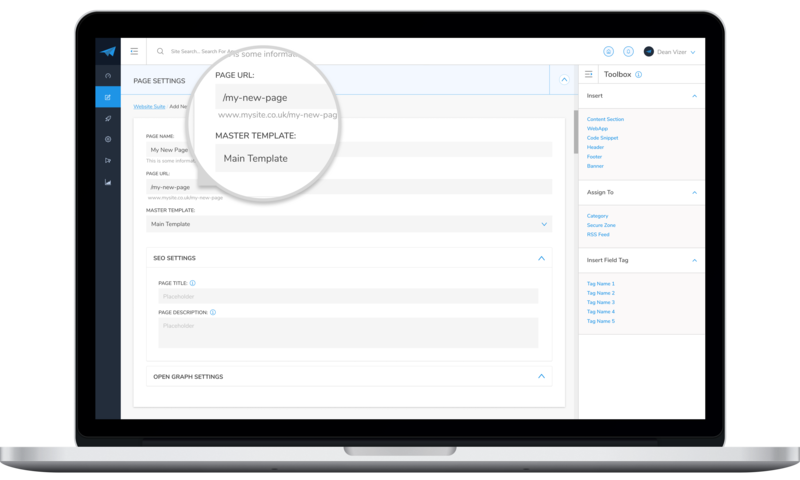 Page Builder puts you in complete control over your site. Create pages using Sections and Layouts customised to your business. Control everything without touching code. Pull in dynamic content from our powerful WebApps feature, this could be blog posts, team profiles, case studies, services - the possibilities are endless. WebApps take websites to the next level, create dynamic content that can be used anywhere on the site. This is a tool for agencies to help businesses add bespoke and interactive functionality without the typical high costs or expertise. Request a demo to see the full power of WebApps and how you can build them without any technical expertise. Another powerful tool that puts agencies in control of the look and feel of the site either by designing from scratch or using our best practice Design System. Take our responsive layouts and customise them to the business requirements and branding. 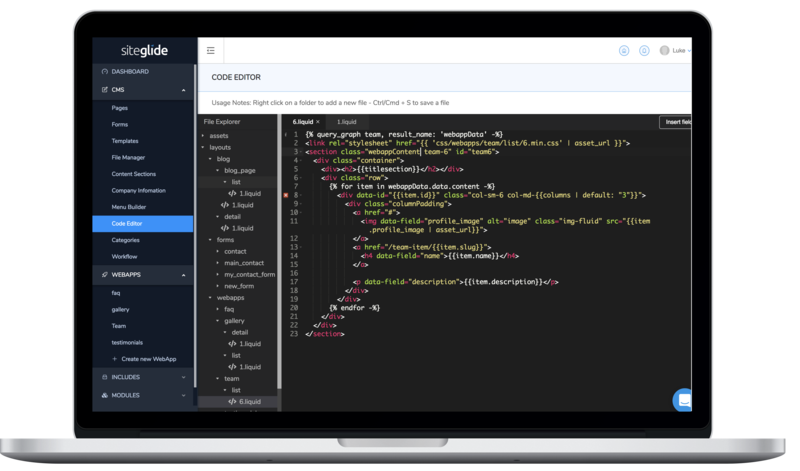 Code Editor coupled with WebApp Builder offers unparalleled flexibility and endless possibilities all without technical expertise. The Siteglide CMS is simple to use but has everything you need. Siteglide is built to work on any device and our section layouts are responsive straight out of the box. We have built all the necessary Search Engine Optimisation tools right into the core of Siteglide. Every Siteglide website comes with a free SSL certificate to ensure your site and your visitors are safe. Amazon Web Services (AWS) is the industry standard in hosting and helps ensure security, speed and reliability. Our Visual Editor redefines how businesses and marketing agencies manage content: with ease. A unique way of quickly creating content based on layouts and a well defined structure. All the blogging tools you would expect but even easier to use and fully integrated with your site. Build bespoke databases without any technical expertise. Simply point and click to create fields and insert data. 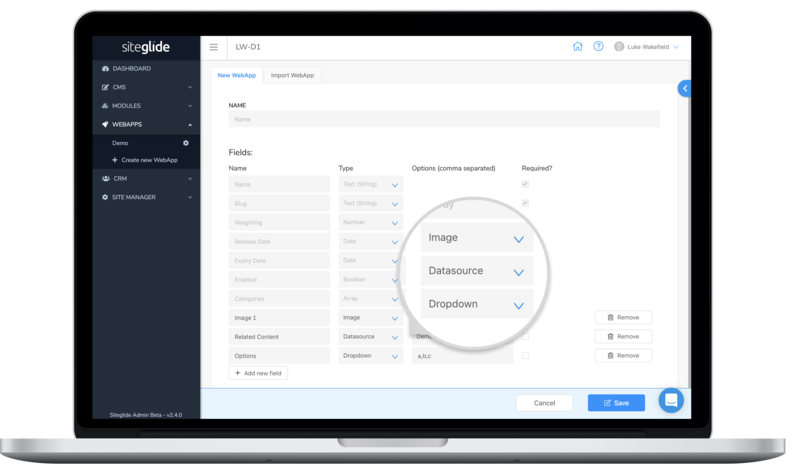 Manage global site details in one place that update across the whole account. Take complete control of your site. Fully customisable forms that integrate with your marketing activity and automated processes. A really easy way to manage the navigation for your site. Pick which pages to show and how they appear. Manage all your assets in one place including images, PDFs and videos that can then be used anywhere. Customise our best practice responsive layouts or build your own, you're in charge. With dynamic data it's important to keep people updated on new items whether it's blog posts or case studies. Siteglide is integrated with Google Analytics to capture vital statistics and help you improve your marketing. Use categories to further enhance WebApps and dynamically load the most relevant content.